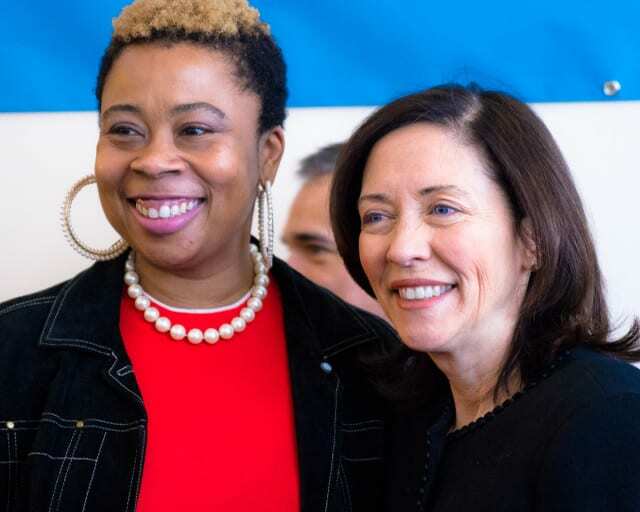 Flanked by Linda McVeigh, executive director of Country Doctor Community Health Centers and patients from the clinic, Senator Maria Cantwell came to 19th Ave E Thursday to announce a step forward in providing affordable health care. Cantwell said the Federal Basic Health Plan Option (FBHPO) will finally launch in 2015. In 1987, the late Governor Booth Gardner signed Washington State’s Basic Health Plan into law at the same Country Doctor clinic — it’s now become the basis for the federal plan, thanks in part to Senator Cantwell’s writing it into 2010′s Affordable Care Act. TheSunBreak.com has more details on the announcement and Cantwell’s appearance on Capitol Hill. This entry was posted in Community, News, etc. by chsstaff. Bookmark the permalink.